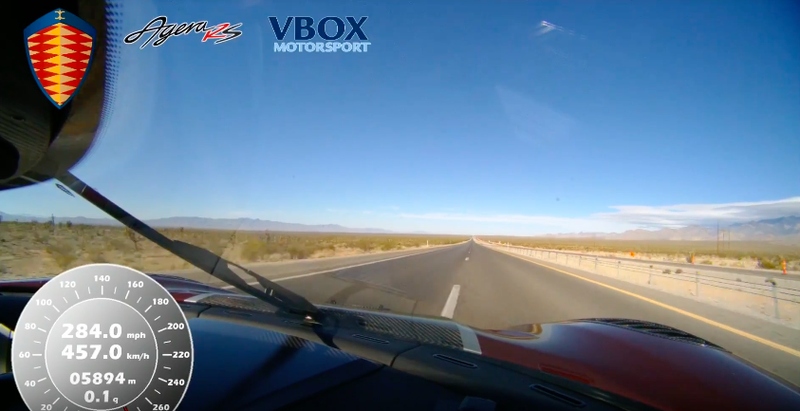 On Saturday, the mad Swedes at Koenigsegg did something truly remarkable: in an Agera RS, a factory driver achieved an average speed of 277.9 mph during two runs on Nevada’s Route 160 between Las Vegas and Pahrump. This may make the Agera RS the world’s fastest street legal production car. Now you can see what those runs looked like from the driver’s perspective. The nice folks at Racelogic sent us the video recorded by the VBOX HD2 during the two runs, and if you’ve ever been curious what approaching 290 mph looks like from the cockpit, you’re about to find out. 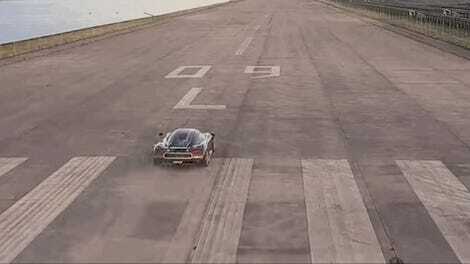 The video shows both runs: one with a top speed of about 272 mph, the other way up there at 284 mph. The two speeds were averaged together to get the official time. Throughout the day, the max speed seems to have been 284.3 mph. It’s almost terrifying. Even with the straight road and presumably an even grade, I can’t even imagine how close you could come to disaster at that velocity. At the same time, I’m extremely jealous of the pure, unfiltered speed driver Niklas Lilja must have felt. It must have been scary and liberating at the same time. Koenigsegg told Jalopnik the run was done on Michelin Pilot Sport Cup 2 tires, the same tires delivered to customers, and that Michelin reps were on-hand to make sure everything went okay. We’ll update this post as we get more information, but preliminarily, it looks like the Agera RS is faster than the Bugatti Veyron Super Sport.